Federalism is great for many reasons. When you have dozens of states with the freedom to choose different policies, you get lots of innovation and diversity, which helps identify policies that work. You also can minimize the cost of mistakes. When a policy error occurs in one state (for example, government-run healthcare in Vermont), it quickly becomes obvious and the damage can be contained and maybe even reversed. But when a mistake is made nationally (such as Obamacare), it’s not as easy to pinpoint why the economy is weakening and fixing the error thus becomes more difficult. And it should go without saying that federalism is desirable because it facilitates and enables competition among jurisdictions. And that limits the power of governments to impose bad policy. 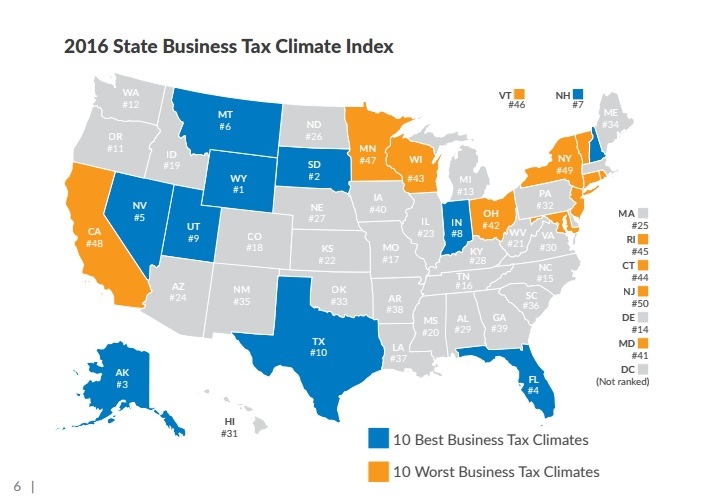 These are some of the reasons why I’m a huge fan of the Tax Foundation’s State Business Tax Climate Index. It’s a rigorous publication that calculates the good and bad features of every state’s tax system. It then add together all that data to generate a very helpful ranking of the nation’s best and worst state tax systems. And since that’s what people care most about, let’s cut to the chase and look at the states at the top and the bottom of the Index. There are a couple of things which should be obvious from these two lists. First, it’s a very good idea to be part of the no-income-tax club. It’s no coincidence that 7 out of the top 10 states don’t have that pernicious levy. Second, perhaps the biggest lesson from the states in the bottom 10 is that it’s basically impossible for a state with a big government to have a good tax system. Third (and here’s where I’m going to be a contrarian), I’m not sure that Wyoming and Alaska really deserve their high rankings. Both states use energy severance taxes to finance relatively large public sectors. And while it’s true that energy severance taxes don’t do as much damage to a state’s competitiveness as other revenue sources, I nonetheless think there should be an asterisk next to those two states. So I actually put South Dakota in first place (though I realize I’m implicitly incorporating government spending into the equation while the Tax Foundation is only measuring the tax environment for business). Now that we’ve hit the main highlights, here’s some explanatory information from the Index. …the Index is designed to show how well states structure their tax systems, and provides a roadmap for improvement. …The absence of a major tax is a common factor among many of the top ten states. …This does not mean, however, that a state cannot rank in the top ten while still levying all the major taxes. Indiana and Utah, for example, levy all of the major tax types, but do so with low rates on broad bases. The states in the bottom 10 tend to have a number of afflictions in common: complex, non-neutral taxes with comparatively high rates. And here’s some details about the Index’s methodology. The Index…comparing the states on over 100 different variables in the five major areas of taxation (corporate taxes, individual income taxes, sales taxes, unemployment insurance taxes, and property taxes)… Using the economic literature as our guide, we designed these five components to score each state’s business tax climate…The five components are not weighted equally… This improves the explanatory power of the State Business Tax Climate Index as a whole. …this edition is the 2016 Index and represents the tax climate of each state as of July 1, 2015, the first day of fiscal year 2016 for most states. Here’s a map showing the ranking of every state. Top-10 states are in blue and bottom-10 states are in orange. 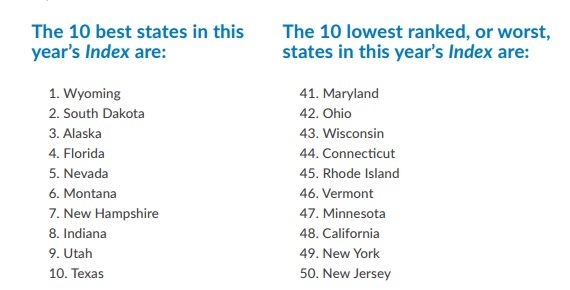 At the risk of repeating myself, notice how zero-income tax states rank highly. The Wall Street Journal editorial page combed through the report for highlights. The biggest success story in recent years is North Carolina, which joined the flat tax club. …North Carolina, which in 2013 slashed its top 7.75% income tax to a flat 5.75% and its corporate rate to 5% from 6.9%. The former 44th is now ranked 15th. Given Martin O’Malley’s horrible record in Maryland, I’m surprised that he hasn’t picked up more support from crazy lefties in the Democratic Party. As Governor of Maryland from 2007 to 2015, Democrat Martin O’Malley increased some 40 taxes including the corporate rate to 8.25% from 7% and the sales tax to 6% from 5%. And here’s some good news from an unexpected place. The trophy for most-improved this year goes to Illinois, which jumped to 23rd from 31st… The Tax Foundation notes that the leap occurred “due to the sunset of corporate and individual income tax increases”… First-year Republican Governor Bruce Rauner has let the income-tax rate lapse to 3.75% from 5% and the corporate rate to 7.75% from 9.5%, though Democrats are trying to push them back up. Given how the tax hike backfired, let’s hope the Governor holds firm in this fight. Now let’s return to some of the analysis in the Tax Foundation’s Index. Here’s some of the academic evidence on the importance of low tax burdens. Helms concluded that a state’s ability to attract, retain, and encourage business activity is significantly affected by its pattern of taxation. Furthermore, tax increases significantly retard economic growth when the revenue is used to fund transfer payments. …Bartik (1989) provides strong evidence that taxes have a negative impact on business startups. He finds specifically that property taxes, because they are paid regardless of profit, have the strongest negative effect on business. Bartik’s econometric model also predicts tax elasticities of –0.1 to –0.5 that imply a 10 percent cut in tax rates will increase business activity by 1 to 5 percent. …Agostini and Tulayasathien (2001)…determined that for “foreign investors, the corporate tax rate is the most relevant tax in their investment decision.” …Mark, McGuire, and Papke (2000) found that taxes are a statistically significant factor in private-sector job growth. Specifically, they found that personal property taxes and sales taxes have economically large negative effects on the annual growth of private employment. …the consensus among recent literature is that state and local taxes negatively affect employment levels. Harden and Hoyt conclude that the corporate income tax has the most significant negative impact on the rate of growth in employment. Gupta and Hofmann (2003)…model covered 14 years of data and determined that firms tend to locate property in states where they are subject to lower income tax burdens. The message is that all the major revenue sources – income, sales, and property – can have negative effects. Which explains, of course, why it’s important to control state government spending. And one final point to make is that we should do everything possible to shrink the size of the central government in Washington and transfer activities to the private sector or states. This isn’t because states don’t make mistakes, but rather because competition between states will produce far better results than a one-size-fits-all approach from Washington. P.S. A study from German economists finds that decentralization limits economically harmful redistribution outlays. P.P.S. And a study from the IMF reveals that decentralized government is more competent and efficient. I agree that the better measure is government spending as a percentage of state GDP. Tax revenue efficiency and the types of tax will be better, or less painful at least, in states with low spending per GDP generally. On the other hand, I will point out that every state has a property tax and some of the most egregious are in states at the top of this index. The property tax is the most immoral of the three forms of personal taxation in my opinion. Property does not in and of itself produce wealth and even if it does, you must usually liquidate it, or use labor to produce wealth latent to the property (e.g. farm, pump or mine), before you can realize that wealth. In this way, property tax is actually regressive as the poorer you are, the less likely you are able to produce wealth with your property and the more your property becomes a burden instead of an asset. Worse, as you develop your property its extrinsic value often out paces the intrinsic value. It may take years to develop the mineral production of a property, but the moment you discover that there is oil below, the market value of the property increases dramatically and consequently the property tax. Or maybe a lower-middle class family has some undeveloped property and wishes to put a house there to rent out. The moment the dwelling is built, the taxable value goes up drastically before the family can find a renter and begin realizing revenue.